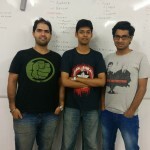 Viraj shah Co Founded Niffler along with Edul Patel & Prince Arora. All 3 of them were working with investment banks – Citi and Duetsche and the three of them felt that they should start up. They met over weekends and discussed different ideas and after some time, they realized that while customers were purchasing online, majority of sales still happened at the brick & mortar shops and connecting the brick & mortar stores to the consumers was an underserved need. They analysed the market for similar services and spoke to a few people and found out that the connect through mobile would be a great way to begin and Niffler was born. They realized that Mobile is growing in India and many affordable smart phones being in the hands of many people, this will be a huge space that will blow to proportions. The mobile influenced sales in offline stores is where they wanted to play. They went and spoke to a lot of people – friends, family to understand their deeper needs and built a version of the app and tested it in the market . They divided the shop owners into three categories – The ones that did not want to do anything, the ones that were on the fence and the ones who were open to trying out new ideas. They had to go to every shop to sell the concept as this was a little new for the market. Based on certain conversational traits of the shop owners, they divided the buyers into the three categories and went after those who were open to new ideas. Their initial idea was to run a smart phone based social marketing platform which would encompass loyalty, offers and recommendations. The interest shown initially by the shop owners did not translate into business and upon a bit of thinking they realized that this is not working out because both from a store as well as a consumers perspective, this takes time to grow and especially in a B2C space, the customers expect instant gratification unlike the B2B space where they give sometime to realize the benefits of their investments. The B2C space also requires rapid and mass adoption because of ticket sizes being small and they cannot wait for a long time like the B2B players can. They decided to focus on aggregating offline deals. The vision is still the same where they help people connect with the stores through mobile but now they have begun exposing the offers that the brick & mortar shops have pointing the product and the contact details so that people can go and buy from the shops directly thereby giving the stores a great exposure which they don’t have today because those shops are in remote corners and the customers will not even know about their existence. On the outreach mechanisms, it was sheer Cold Calling into these shops and the all the three founders went directly and sold. Even though there were primary responsibilities where Viraj to take care of Business Development, Edul to take care of Product Development and Prince to take care of backend server-side technologies, the three of them felt that it was essential that they understood the business from a customer’s perspective as even the backend is driven by what the customer says. This worked to their advantage because they relied on the customers feedback from three people perspective rather than one of them learning it and coming back and relaying and that helped the product become better very rapidly. On the sales objections, it was a chicken and egg situation because they were building a two sided marketplace. Any brand will be interested in joining their network and paying them the subscription fees If they had a million users but they will not have a million users if they do not have big brands. So, like any other B2C startup, they had to figure it out. It was constant iterations of changing the product according to the markets needs and being persistent which got them a critical mass at both the ends. They initially focussed on the shops because without shops consumers downloading the app will not see anything and they went after the early adoptors. They used the time tested model of find those early adoptors, reach them, convince them to buy, go to other people and say that someone else is using it and making them buy. No shop owner disputed the concept, but all of them had a doubt if they would be benefited or not. Niffler(http://www.niffler.in/), has 15 employees and have around 30000 users and 3000+ offers listed from 15000+ stores. They are planning an iOS version by end of March. They have raised 1mn from SAIF.